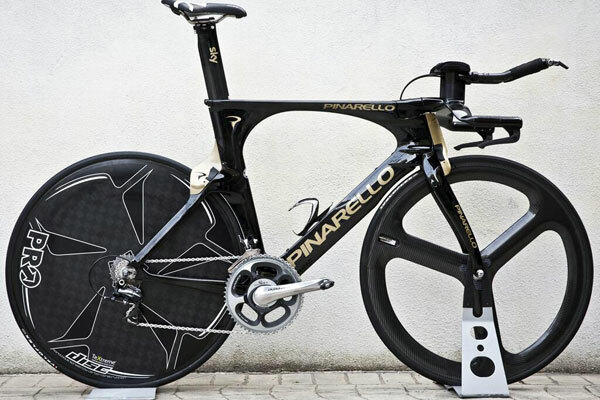 Sir Bradley Wiggins’ new Pinarello Bolide time trial bike has caused something of a stir since being revealed earlier this week. Wiggins will use the newly-developed time trial machine during his assault on the Giro d’Italia overall classification, starting tomorrow (Saturday, May 4). 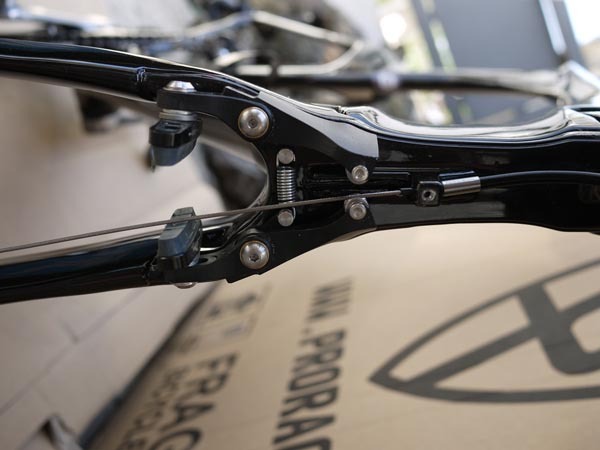 Sky team mechanics were busy assembling the bike in Naples when CW dropped by to take a look. 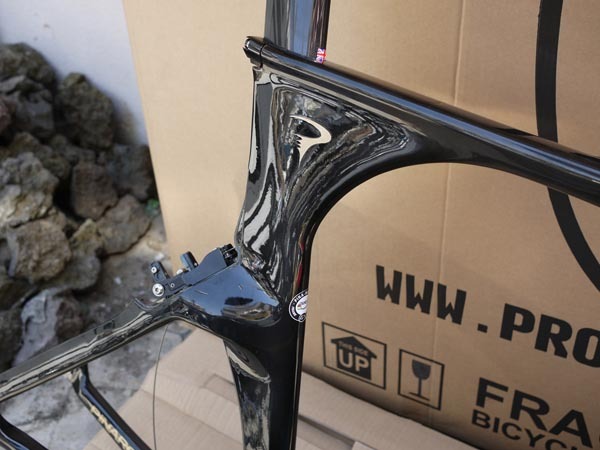 The bike will get its first competitive airing during Sunday’s team time trial stage. 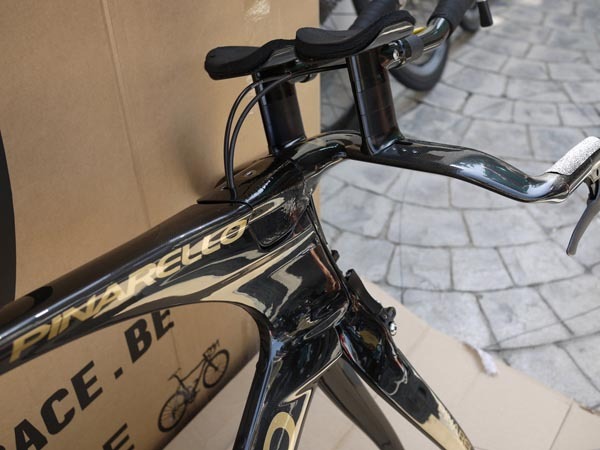 Wiggins has not ridden a competitive time trial since scooping the gold medal at the London 2012 Olympic Games time trial in August – and that was done on a UKSI bike, not a Pinarello. 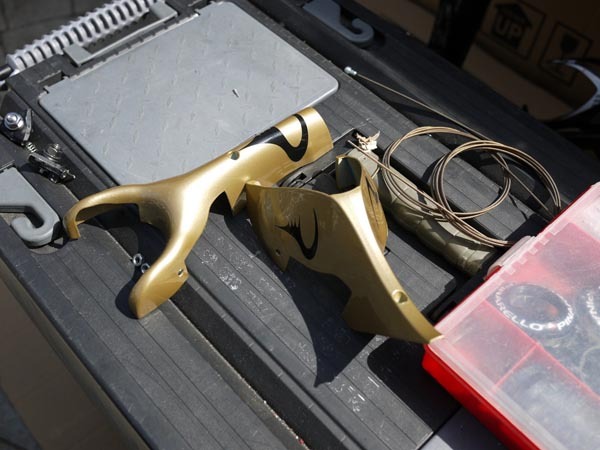 The one-off gold and black paintwork – and gold SRM unit – on Wiggins’ bike commemorates that memorable occasion. Wiggins will then use the bike during the long, 55km individual time trial next Saturday (May 11) where he will be hoping to put serious time into his rivals. 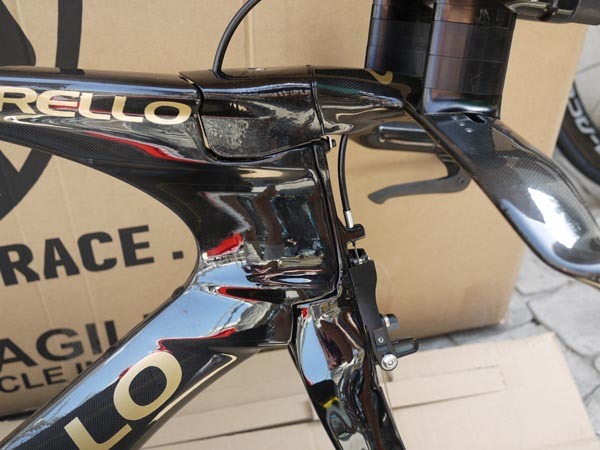 The Bolide replaces the previous Graal model that Wiggins used during last year’s Tour de France. 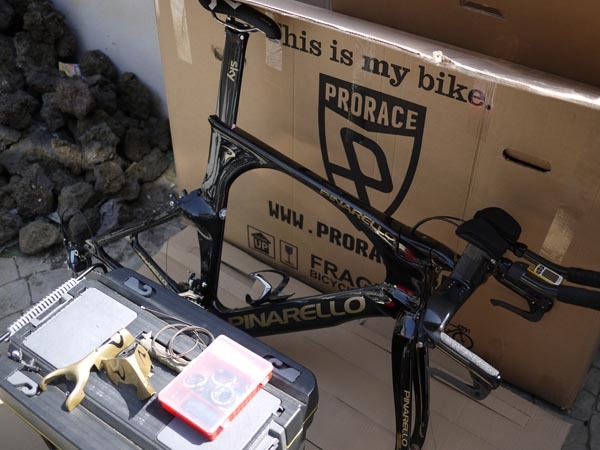 He will only have one Bolide at his disposal at the Giro, if anything happens to it Wiggins will switch to a Graal spare bike. 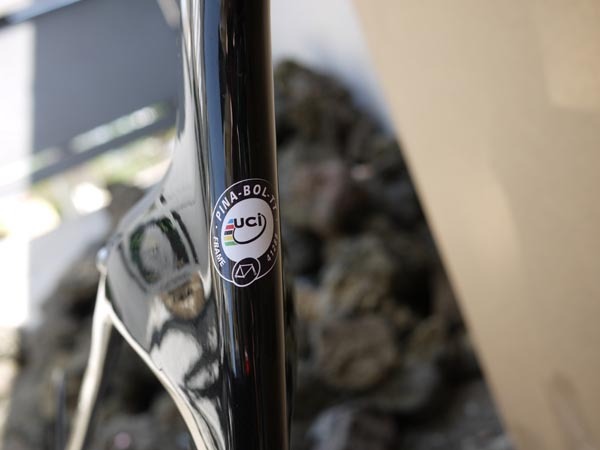 Note that the frameset is emblazoned with a UCI Approved sticker, meaning that it has passed the Union Cycliste Internationale’s stringent rules for acceptable geometry and aerodynamics. 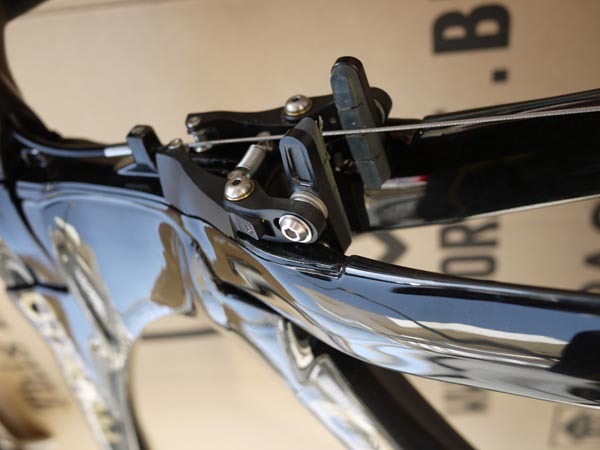 Wiggins is sticking with mechanical Dura-Ace gears rather than electronic as he prefers the mechanical shifters, which afford him a longer reach on the bars yet still adhere to UCI regulations. 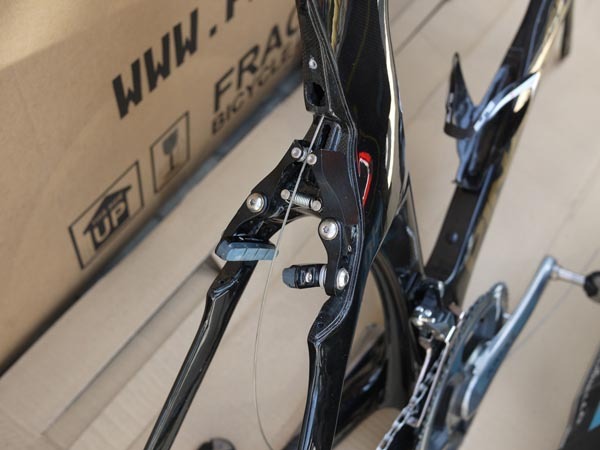 The exposed cabling would be hidden if he was using an electronic Di2 system. The bike is equipped with regular round rings, rather than the distinctive ovalised Osymetric rings that Wiggins has used in recent years.